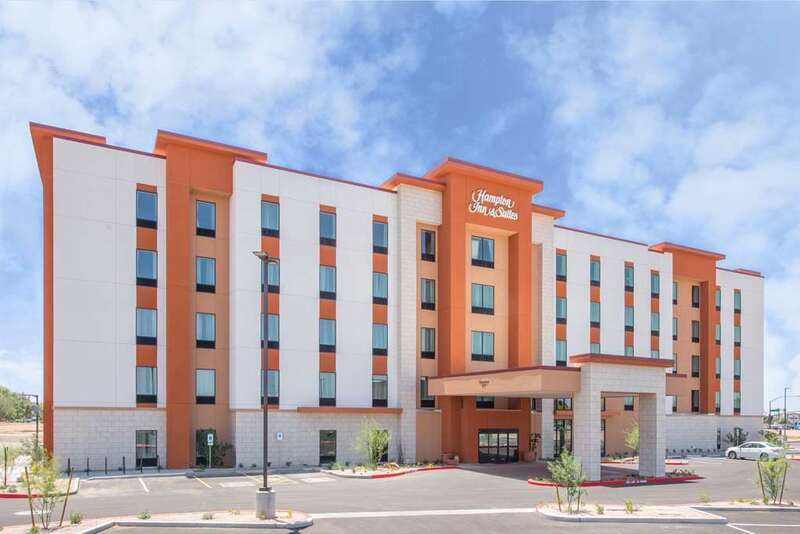 Welcome to Hampton Inn - Suites Phoenix East Mesa. Conveniently set next to Banner Gateway Medical Center our hotel is moments from local restaurants and conveniences and 15 minutes to Historic Downtown Gilbert golf courses malls and Spring Training facilities. Reach the Phoenix-Mesa Gateway Airport in 15 minutes and Sky Harbor Airport /PHX/ in 25 minutes. We*re happy to offer free shuttle service within a 5-mile radius of our Mesa AZ hotel. Our inviting guest rooms have modern decor and comforts like free WiFi a 40-inch HDTV mini-refrigerator and coffee maker. Work smart with ergonomic workspace and free remote printing and get cozy in the clean and fresh Hampton bed. Our studio suites offer more space to stretch out plus a wet bar and sofa bed great for longer stays. Wake up to Hampton*s free hot breakfast including fresh-baked waffles oatmeal scrambled eggs cereal and fruit. Our friendly staff can recommend East Valley restaurants when you feel like dining out and our TREATS Shop is open 24 hours for any snack or drink cravings. Unwind in the heated outdoor pool and whirlpool after a long day or enjoy a cool desert night by the firepit. For your convenience our East Mesa hotel provides free 24-hour fitness and business centers. Plan a meeting or social gathering for up to 80 guests in our stylish and flexible event space. Catering packages and A/V equipment are also available.